It's now been almost three weeks since I joined the October Unprocessed Challenge and vowed not to eat processed food this month. 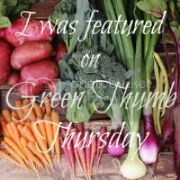 In my last update, I shared that I felt great and I still do! Despite an incredibly busy few weeks, I feel fantastic. My days are packed full and my nights include lots of wake-ups with my son, but I still feel energetic at the end of the day. Placebo effect? I don't care, what the reason is. I've been cooking up a storm. Homemade bread is a must, along with lots of fruits and veggies still. As the harvest season winds down, I'm still getting what I can locally like apples, butternut squash, and some beautiful eggplant that I picked last weekend on my family's farm. I have had a few slip ups. I had pizza and pumpkin pie at my brother's house. To say no would have been rude! And there have been a couple of times when I was too busy to cook so we opted for convenience, but it was always a very conscious decision. I've got a forgiving nature, and I forgive myself and move on with it. I'm thinking that in order for this to be a long-term change, I need to go in with a 90/10 philosophy. If I avoid processed foods 90% of the time or more, I'm doing well. The most amazing and unexpected part has been the weight loss. In 20 days, I lost 3.8 pounds. To me, that's just amazing. I'm now 5 pounds less than my pre-pregnancy weight, and it's been probably five years since I weighed this amount. I haven't limited portions or anything typical of dieting, I've just been eating nutritious foods when I'm hungry. I'd love to see the trend continue but I doubt I'll lose too much more. We'll see! The hardest part of the challenge by far has been figuring out what to eat for snacks. Carrots and hummus or guacamole have become staples, but I miss my favorite processed carbs: pretzels, granola bars and crackers. If you have any homemade, whole wheat, naturally sweetened recipes for those please share! 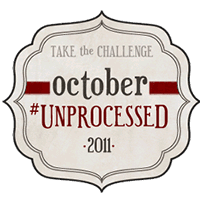 Are you doing the October Unprocessed Challenge? How's it going? You can make soft pretzels, as well as a bunch of other bready snacks, using your regular bread dough. I wrote a post about it along time ago - search the archives for pretzels and you should find it. We make breadsticks also from our homemade bread. The recipe makes 2 loaves so one is formed and baked. The other after the first rise is cut into pieces, rolled thin and place on an oiled jelly roll pan (10x15?) sprinkled with some corn meal. Brush them with butter and sprinkle on garlic powder or sesame seeds or grated cheese or combination of anything that sounds good to you. Let them rise until doubled and bake at 350 till done. Good for dipping in marinara or eating as is. They would probably keep a couple days, though they are gone here before that. Glad to hear your month has gone so well. Mine not so...just cannot give up a couple diet sodas a day. Awesomeness!! The weight loss gets me because I feel like I'm always battling 5 lbs. I do eat a lot of non-processed but I think it might be time to take a closer look. For granola bars, I think this recipe would qualify. It's delicious. Heidi Swanson will give you crackers and little snackie type things using whole grains, natural sweeteners, and all sorts of tasty things. I heartily recommend her site for most things. She's also where I go whenever I have a veggie that I can't figure out how to use! I'm going to try Green Bean's granola bars! Emerald Apron, what is your definition of unprocessed food? Are you trying to not buy anything that comes in a box/bag (anything that is not single ingredients)? Ooops! I meant to say *real food alternative* not real good! Thanks for all the ideas! I've been doing mostly homemade but if not made at home, it has to pass the "kitchen test" meaning that I would be able to make it in my kitchen with real ingredients. Pasta and cheese are things I could make but don't have time, so I buy versions that pass the kitchen test. We eat very little processed food and I'm always trying to buy less and less. When we switched to this diet my husband dropped a lot of weight and I dropped around 30 lbs, I've put a little of that back on but am back to losing it. It's fun when people ask how I dropped the weight I say "eating brownies and cookies." Because seriously I bake at least every weekend. One of our favorites around here is homemade pizza. I make up a lot at once and freeze them. They are then as easy as a store bought frozen pizza but way better. I also make cheese breadsticks and normal breadsticks. Those are my husband's favorites. One tip, always use bread flour for pizza crust, I didn't for years and they were good but noticed a real difference when I switched. Also make lots of other frozen food. It's what helps keep us on track. I pre-cook meat to throw in pasta and such. Make and freeze hamburger buns, french bread (which I cut up so that I can pull a few pieces at a time), lasagna, cookie dough, etc... Then when I don't feel like cooking I can go to my freezer and pull something out and we don't have to eat crappy food. We still eat out some, though most of the time that's because I ran out of stuff in our freezer and don't feel good or something. My food allergies make it easier for me to stay away from the food because there are two places in this town where I feel safe eating. Also haven't had fast food in almost 3 years.